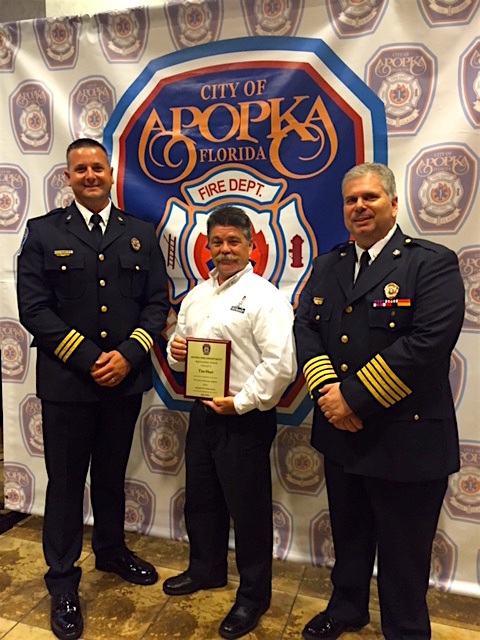 On July 22nd at the annual Apopka Fire Department award ceremony Tim Hoyt of 1-800-BoardUp, a division of Orange County Construction 911, Inc., was presented with an Appreciation Award. This award was presented for ‘contributing to the community and providing their citizens with 24/7 emergency service’. 1-800-BoardUp provides service to City of Apopka Fire Department area and has secured several building to ensure a safer community for the residents. 1-800-BoardUp has also contributed supplies and supports the annual Apopka Fire Department children’s fire camp. This camp was created to help community kids become aware of career choices in Public Safety that are available when they graduate high school. 1-800-BoardUp would like thank the men and woman of the Apopka Fire Department for their dedication and commitment to their citizens.